Hope Summer Repertory Theatre is bringing back to its stage Rodgers and Hammerstein’s classic “The Sound of Music” after 27 years. Filled with songs such as “Climb Ev’ry Mountain”, “My Favorite Things”, “Do-Re-Mi”, and “Edelweiss”, “The Sound of Music” remains a perennial favorite, retaining a special place in the hearts of the public for more than 50 years. “The Sound of Music” plays in rotating repertory at 8 p.m. on June 13, 14, 20, 25, 28, followed by July 2, 10, 16, 21, 24, 29 and August 2, 4, 7 in the DeWitt Center main theatre. The musical follows the heart-warming, romantic journey of Maria, a novice nun, when she leaves her convent and undertakes to serve as governess for the seven children of the widowed Captain Von Trapp. Her growing rapport with the youngsters, coupled with her generosity of spirit, gradually captures the heart of the entire family. HSRT last produced “The Sound of Music” in 1987. Playing the role of Maria is Amanda Giles who recently graduated from the Chicago College of Performing Arts at Roosevelt University with a BFA in musical theatre. Giles has been working in the Chicago theatre scene, and is now beginning her first season with HSRT. Also making his HSRT debut is Dwight Tolar (AEA) as Captain von Trapp. With an MFA from Wayne State University, Tolar has been an assistant professor for The School of Music, Theatre, and Dance at Kansas State University for the past 10 years. In the role of Mother Abbess is Linda Dykstra M.M., a lyric soprano and voice teacher at Hope. Frequently featured as a soloist in West Michigan, she has also performed extensively in the Midwest and the Eastern U.S., as well as Salzburg, Prague, Munich, Berlin, and numerous other venues in Germany. In 1997 she was awarded the Rosa Ponselle Foundation’s Voice Teacher of the Year Gold Medallion. 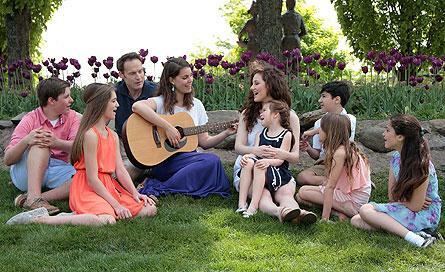 All but one of the Von Trapp children have been selected from Holland’s own pool of talented children. These local rising actors include Sam Lowry as Friedrich, Marlies Otteman as Louisa, Adam Chamness as Kurt, Piper Kendall as Brigitta, Mia Silguero as Marta, and Grace Ford as Gretl. Taylor Quick from Little Rock, Arkansas, will perform Liesl. The supporting cast includes Maddie Baldwin as Sister Berthe, Taylor Harvey as Sister Margaretta, Ellie Campbell as Sister Sophia, Michael Dewar as Franz the Butler, Shannon Huneryager as Frau Schmidt, Aleksandr Krapivnik as Rolf Gruber, Kate Thomsen as Elsa Schraeder, Chip Duford as Max Detweiler, Evan Adams as Herr Zeller, and Skye Edwards as Admiral von Schreiber. Additional ensemble members are Olivia Donalson, Joshua Kumler Taylor Ann Krahn, Theo Zucker, Kate Colburn, Kelsey Colburn, Aaron Alcaraz, Bradley Hamilton, and Thomas Joscelyn. Director David Colacci is in his 29th season with Hope Summer Repertory Theatre and his 23rd as artistic director with HSRT. In addition to portraying Admiral von Schreiber, Skye Edwards is the choreographer for “The Sound of Music.” He is a recent graduate of Hope College, where he majored in dance and theatre. The production team for “The Sound of Music” is as follows: Joe Flauto as the scenic designer, Stephen Sakowski as the lighting designer, Kathryn Wagner as the costume designer, Amanda Werre as the sound designer, Grace Madden as the Stage Manager, Rich Perez as the managing director, and Rachel Hasse as the production manager. Individual tickets are now on sale at the DeWitt Ticket Office (141 E. 12th St), which is open Monday-Friday from 10 a.m. to 5 p.m. and beginning on Saturday, June 14, will also be open on Saturdays from noon through intermission. In addition, the college’s downtown ticket office, located in the Anderson-Werkman Building at 100 E. Eighth St., is open Mondays-Fridays from 10 a.m. to 5 p.m. Adult tickets are $30 for Mezzanine or Balcony and $25 for Orchestra seating. Senior, faculty and staff tickets are $28 for Mezzanine or Balcony and $22 for Orchestra seating. Student tickets are $15 for all seating. Patrons can also purchase individual tickets online by visiting hope.edu/hsrt or calling (616) 395-7890. Ticket options also include Season Ticket Packages that save patrons up to 38 percent off individual ticket prices and guarantees a terrific seat for every performance. Season Ticket Packages are available at both ticket locations. The Best Buy Package offers seating for four main-stage performances for only $75 for adults, $70 for seniors and $40 for students. The Super-Saver Package includes seating limited to the orchestra and admission to the four main-stage productions for $60 for both adults and seniors and $40 for students.